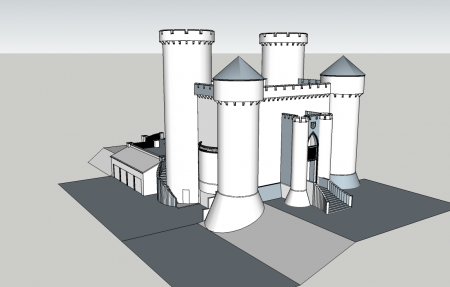 So, tangentially related to the castle construction, is the fact that I need to move. We’re moving in July, we have a rental house already setup in the North Shore area, we’ll stay there until the castle is complete, ideally next summer (I hope we can get it done by sometime next summer). I’ve got enough stuff here where this will not buy a DIY move, we need a full semi, a professional mover. I’ve spoken so far with Allied and Mayflower. The Allied guy/service was more reachable, Mayflower I had to wait and deal with phone tag a lot. Allied always got right back to me. For their in person estimate the Mayflower rep gave more detailed information. Allied has given me a guaranteed quote, and a guaranteed delivery date of the Monday I want (if we pack and leave on Friday/Saturday, delivery Monday). Mayflower’s quote is less, and they say I would probably get Monday delivery, but it could be as late as Friday. They also say that Allied is yanking my chain about a guaranteed delivery date, Allied insists they aren’t. Allied has quoted ~23,000 pounds and ~$14,000. Mayflower estimated ~17,500 pounds, rounded up the 20,000, and ~$12,000. Allied is guaranteed, if the actual shipment is 25,000 pounds we pay nothing more. Mayflower has a 10% buffer, so at 22,000 we pay nothing more, but above that we would pay. Mayflower said they could take my guns, but not my ammo, Allied said they could take neither. Insurance was the same. So worst case scenario, with Mayflower, we’d potentially be without our stuff for a full week. We could sleep on air mattresses (that we bought) in our rental house, do a ton of laundry, eat out every night, etc. Or stay in a hotel, a bigger problem from me at least would be the inconvenience of it, with my computer and whatnot that I need for work. Perhaps I will pack and transport that myself (I’ve also thought about trying to time a Dell delivery to get me a new PC delivered to the rental that day). The Internet isn’t much of a help, all moving companies have pretty bad horror stories if you look hard enough. The Mayflower rep did give me more detailed information, but some of it felt a little like BS, and she was always harder to reach and get out here to me. Of course, with the weight issue, the Mayflower quote could end up being closer to the Allied quote, and we wouldn’t have the guaranteed delivery date. We also need to move my wife’s 78 VW Beetle, which is included in neither quote. Both quotes are higher than I was hoping for or wanted, based on my prior research I thought it would be around $8,000. We also have to transport our single cat for the 10 hour car drive, that’ll be a first. So if anyone has recommendations on movers, on car moving services, or on driving long distances with a cat in the car, please comment below. Thanks.